The SAT Reading test will no longer be a mix of questions on vocabulary and prose. On the new SAT, all of the questions are based on passages, you are not tested on obscure vocabulary, and some passages may require you to analyze graphs and data. In this sense, the new SAT Reading test doesn’t just evaluate how you can interpret prose and fiction passages; you also will be tested on passages and data with a historical, scientific, and sociological focus. 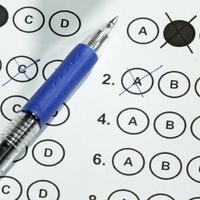 These new questions are meant to assess your readiness for data-based college courses. If you aren’t fully comfortable with your data interpretation skills, these questions may be particularly difficult for you. Plan ahead and start practicing these skills by reading essays or studies that are scientific, historical, and nonfiction in nature, and immerse yourself in data sets and graphs. Try using a prep book designed for the new SAT. In the past, the SAT did not venture into math topics beyond the level of Geometry and Algebra I, but on the new SAT you can expect questions involving complex math, including trigonometry and new concepts in statistics and geometry. If you’re taking the new SAT before you’ve reached these more advanced topics in class, find a math tutor or reach out to a teacher for help mastering these concepts before the test. In addition, make it a habit to practice these new concepts on your own—create trigonometry flashcards or take practice tests in advanced algebra. Maximize your score by becoming comfortable with every topic tested on the SAT Math test—even the hardest topics! You may already be familiar with the current SAT Writing test, which includes a mandatory essay and about 49 questions that test your command of grammar, style, and punctuation. The new SAT Writing and Language test will still test these concepts, but will also test your knowledge of the message, organization, and development of a passage at varying levels of difficulty. For this test, you should think of yourself as an editor, identifying and correcting factual errors, grammar missteps, and improving the text of various passages, charts, tables, and other infographics. Much like an editor, you will need to consider the tasks of the old test (grammar, style, and punctuation) as well as the passage’s effectiveness as a whole, making decisions about the cohesion and overarching structure of the passage. The old, mandatory SAT essay was a rushed endeavor for many students, who found that constructing and supporting a persuasive essay in 25 minutes was a tough task. The new SAT essay is optional, and it differs drastically from the past SAT essay. The new SAT Essay is 50 minutes long and asks test-takers to thoroughly analyze a short passage. You’re not expected to develop and defend an opinion; rather, you’ll have to analyze how the author of the passage constructs his or her argument using evidence from the passage. Although you may not be used to doing such heavy analysis on a standardized test, with practice your SAT Essay skills—and all of the other new skills required for success on the new SAT—can improve. Kharazmi university, Bachelor of Science, Applied Mathematics. Azad university, Master of Science, Applied Mathematics.